PRESS RELEASE: iZotope, Inc., a leader in audio DSP processing, has released RX 2 and RX 2 Advanced, updates to their award-winning audio repair software suites. With a range of new features and functionality, iZotope has expanded the scope of RX into any field where audio is recorded or restored by both consumers and professionals. Additionally, iZotope is offering introductory pricing on RX 2 and RX 2 Advanced purchases and upgrades throughout October 31, 2010. "RX 2 and RX 2 Advanced are crucial tools if you're recording new tracks or restoring old ones. Whether you're on location with a TV show or recording a voiceover at home for a company presentation, it's a challenge to get a good recording. RX gives you all the tools you need to repair damaged audio and deliver the best recording," explains Jeremy Todd, CTO of iZotope, "RX also includes specialized tools to restoring old recordings from vinyl records, tape and other sources with tools like Declick, Decrackle and automatic azimuth alignment. RX 2 and RX 2 Advanced are a complete set of the best processing tools with an immersive visual editing interface enabling you to quickly repair and deliver high-quality audio." RX 2 builds on the success of the original's Denoise, Spectral Repair, Declick, Declip and Remove Hum modules with iZotope's latest DSP algorithm improvements and the new Decrackle and Channel Operations modules. RX 2 Advanced extends the standard RX with an adaptive Denoiser mode, a Deconstruct module, third party plug-in hosting, iZotope 64-bit SRC™ resampling, MBIT+™ dither, iZotope Radius® time and pitch control, ability to export an edit history, multi-resolution mode for Spectral Repair and automatic azimuth correction. An introductory price of $249 USD for RX 2 and $749 USD for RX 2 Advanced is available through October 31, 2010, and $349 for RX 2 and $1,199 for RX 2 Advanced thereafter. Upgrade pricing is available for RX and RX Advanced owners. 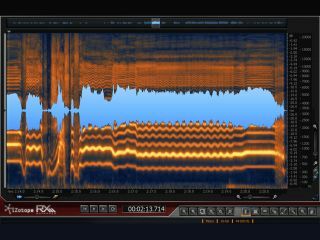 For product information, demo videos and ordering information, visit http://www.izotope.com/products/audio/rx/.